Since running or walking on the treadmill can be quite boring at times, I love tackling treadmill workouts that vary speeds and inclines to hold my interest and give me a great workout at the same time. 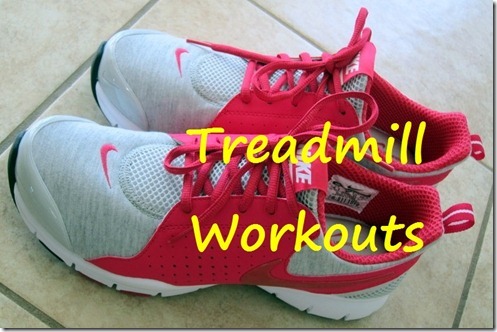 20 Minute Treadmill Interval Workout: Quick and super sweaty! 20 Minute Quick ‘n’ Sweaty Workout: With 10 minutes of speedy intervals, this workout flies by but packs a serious punch. 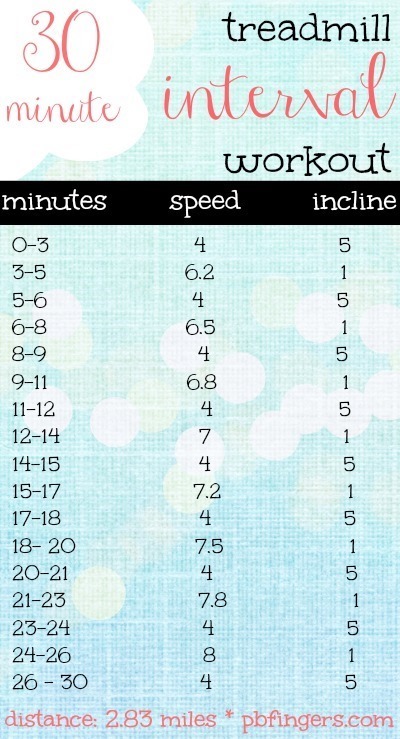 25 Minute Interval Walk/Run Workout: Incline walking and running team up to make one heck of a sweaty workout! 25 Minute Incline Treadmill Workout: Intense inclines make this workout super sweaty! 30 Minute Treadmill Countdown Workout: This workout incorporates 10 minutes of incline walking with bursts of fast running. 30 Minute Incline Walking Workout with a Sneaky 5 Minute Run: A sneak-attack 5-minute run breaks up the incline walking in this workout. 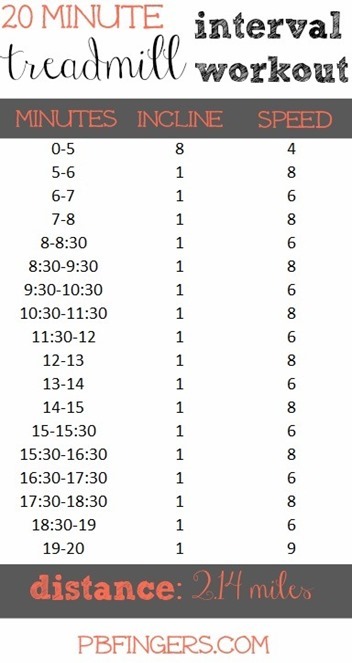 30 Minute Treadmill Interval Walking + Sprinting Workout: Alternating sprinting with walking makes this workout fly by. 35 Minute Running/Walking Mix Up: Perfect workout for when you can’t decide whether you’re in the mood to walk or run. 40 Minute Interval Workout: Six rounds of three minute intervals to keep you sweatin’. 45 Minute “Make Your Face Sweat” Workout: You can’t escape the face sweat when you tackle this workout! 45 Minute Beat Boredom Treadmill Workout: This workout takes you on and off the treadmill. Choose Your Distance: 15, 30 or 50 Minute Treadmill Workout: You pick how long you want to workout to be with this “choose your distance” workout. 50 Minute Treadmill Workout: Work your way up to faster speeds coupled with fast walking breaks.